Kulasekaranpattinam is situated on the way to Kanniyakumari from Tiruchendur. It is 20 kms from Tiruchendur and 65 kms from Kanyakumari. This village is famous for Mutharaman Temple, which is located on the shore of Bay of Bengal. This temple is nearly 150 years old. The Dhasara Festival is celebrated in a grand scale every year during October. Folk dance artists from throughout Tamilnadu perform variety of programmes. The history of shine Basillica is closely connected with the history of the conversion of the PARAVARS the indigenous people of the pearly fishery coast. In fact, our lady of snows, is fondly called in portugeese Senhora, Das Navis Which means our lady of snows. Fr. Vilgiluus Mansi, Whole heartedly took great efforts. 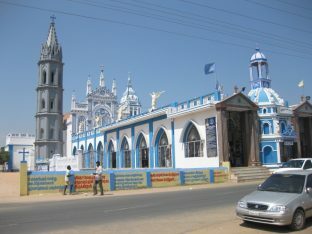 He obtained permission from the Dutch Government (at Ceylon) to construct a new church for Mother Mary of snows. On August 5th 1713, the new church was opened and blessed and the first feast in the new church was celebrated in a grand scale. The story of the birth of Lord Muruga, who is also known as Subramaniya, Karthikeya, Skanda, Shanmuga dates back to the legend of defeating the demon or anti God, Surapadma. To mark an end to the demon, the celestial beings with Indra Dev as the leader, sought the help of Lord Brahma. Brahma who proclaimed that only the spark of Shiva can produce the hero, who will defeat the powers of the evil, sought the help of Parvati and Kama (the God of Love). Parvati agreed to help, and engaged herself in a severe penance to attract Lord Shiva’s attention, while Kama engaged himself in the “suicidal mission” of arousing Shiva from His Samadhi. The penance of Parvati and the sacrifice of Kama paid off finally- Lord Shiva was awakened from his deep state of meditation. He opened his forehead eye and created Six Great Fire Sparks that dropped into the holy Ganges. It was then that, Lord Shiva approved six beautiful maidens called ‘Karthigai Pengal’ (Women of Karthiga) to look after the babies. When the babies attained a certain age Lord Shiva blessed them and made them as one person-Lord Muruga; the divine warrior. Devotees numbering about 5 lakhs will participate in the above festival. On this festival occasion devotees fast for all six days. On the sixth day Surasamharam is demonstrated. On the 7th day Thirukkalyanam to Deivanai is celebrated in a grand manner. Every year on behalf of this festival the district administration declared local holiday for whole district. Vaikasi Visakam is said to be the day when Lord Muruga / Subramanya incarnated in this world with the mission of saving earth from demons like Soorapadman. The Vaikasi Visakam is celebrated in a grand manner in Murugan Temples (Swamymalai, Tiruchendur,…). 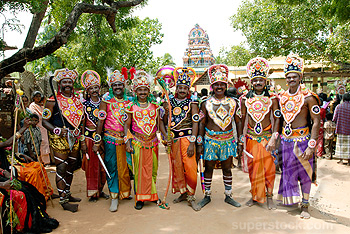 Valli Kalyanam is celebrated in Murugan Temples on Vaikasi Visakam day. The divine creation of Lord Subrahmanya, also known as Skanda, Karthikeya or Murugan, to alleviate the sufferings of the Devas is believed to have occurred on Vaikasi Visakam. (Visakam is one of the 27 Nakshatras). The Star “Vishaka” is considered to be very auspicious, as most of the saint, geniuses and great peple like Buddha were born in this star, Lord muruga born in this star is referred to as “Gnana Panditha” which denotes the authority on wisdom. Karthikeya and Vishaka incidentally represent 3rd and 16th lunar mansions of the zodiac. In fact, visaka is a binary star as per Sanskrit literature, It denotes bothe the intellectual spirityal qualities with complete virtually. Also, it qualities to lead a life of truthful existence. Every year on behalf this festival, the district administration declared local holiday for whole district. In memory of National poet Subramaniya Bharathiyar a memorial was build by Kalki KrishnaMoorthy in 1945 and Mahatma Gandhi showered his blessings on the occasion of opeining. In 18\981 the centenary year of Bharathiyar was celebrated. The former Tamilnady Chief – minister Thiru M.G.Ramachendran opened the new memorial on 11.12.1981 and this was taken over by the Information and Public Relation Department from that day onwards. Umaru Pulavar was a Tamil Muslim poet from Tamil Nadu, India. Umaru Pulavar was born in 1642 in the town of Ettayapuram in Thoothukudi district. He is celebrated as one of the greatest Islamic Poets of India. Early life: The forefathers of the poet came to Tamil Nadu to sell perfumes and settled in Nagalapuram, before moving to Ettayapuram where the poet was born in 1642. Umaru Pulavar’s literary talents flourished under Kadikai Muthu Pulavar court poet of the Ettayapuram Zamin. Literary works : Seerapuranam considered to be one of the best works by him, depicts the history related to Prophet Mohammed Nabi, and it contains 5,027 poems in three ‘Kandams’ (parts), which are Vilathathu Kandam, Noobuvathu Kandam and Hijurathu Kandam. Each of the ‘Kandams’ narrates various stages of the life of Nabi. Recently the Government of Tamil Nadu has opened a memorial constructed for Umaru Pulavar.at Ettayapuram in Thoothukudi District. The monument; a two-storied edifice, has a tomb and prayer hall in the ground floor with a library on the top floor and would be maintained by the Department of Information and Public Relations. He was a prominent lawyer and a trade union leader. He gets credit for launching the “the first indigenous Indian shipping service” between Tuticorin and Colombo with the “Swedeshi Steam Navigation Company competing against British ships” He is also as “Kappal Ottia Tamilan. In 1974, the Government of Tamilnadu construct a new Memorial Fort. The Memorial hall has beautiful paintings the heroic deeds of the saga which gives a good idea about the history of the period. Veerapandia Kattabomman festival : The district administration and Tourism Department celebrates this festival every year in second week of May.